Adrian Fenty, former Mayor of Washington, D.C.
Anthony Townsend, author of "Smart Cities"
Author, speaker, and change agent Gabe Klein will be in Saint Paul taking part in a series of events intended to inspire conversation around the ideas in his new book, Start-Up City: Inspiring Private & Public Entrepreneurship, Getting Projects Done, and Having Fun. Hosted in partnership with Saint Paul Riverfront Corporation and the City of Saint Paul's 8-80 Vitality Fund Fellow with generous support from Knight Foundation. Books available for purchase. Gabe’s book will be available for purchase at the event. Special thanks to Nixon Peabody for hosting this event. Join Lyft for a conversation with transportation luminary Gabe Klein, who will discuss how cities and companies can accomplish big things by aligning goals and bridging the public-private divide. On the heels of publishing Start-Up City, Gabe's message is timely and relevant to anyone working to improve the cities we call home. Join ULI Southeast Florida/Caribbean and Gabe Klein, author of Start-Up City: Inspiring Private and Public Entrepreneurship, Getting Projects Done, and Having Fun, for an inspiring conversation and cocktail event. In Start-Up City, Klein demonstrates how to affect big, directional change in cities—and how to do it fast. Open bar and hors d’oeuvres will be provided and all attendees will receive a copy of the book. Sponsored by Greenberg Traurig. The John S. and James L. Knight Foundation and The Miami Foundation cordially invite you to a talk by Gabe Klein author of Start-Up City: Inspiring Private and Public Entrepreneurship, Getting Projects Done & Having Fun at The Idea Center at Miami Dade College. Join ULI Tampa Bay for their signature event, the 2016 Annual Trends in Real Estate Conference — a half day program filled with insights and predictions from local and national real estate experts. Start-Up City author Gabe Klein will be giving the closing keynote speech from 4:30-5:30 pm. Join Gabe Klein at the Chicago Loop Alliance on Thursday, March 10 at 8:00 am. The 2016 Annual Meeting for Chicago Loop Alliance Foundation will assemble more than 400 business, cultural and civic leaders who have a passion for the downtown Chicago Loop. The meeting’s keynote speaker will be Gabe Klein, author of Start-Up City: Inspiring Private and Public Entrepreneurship, Getting Projects Done, and Having Fun. All guests will receive a copy, with an opportunity for a book signing. Join Gabe Klein at SXSW on Monday, March 14 at 11:00 am. The way we move is changing. Cities are evolving and mobility challenges are increasing. Leaders are trying to integrate cars, buses, trains, bikes, and pedestrians throughout their city, throughout the day. Transportation innovations ranging from bike share to peer-to-peer ride sharing are changing the dynamics of transportation across the world. How do cities integrate new transportation innovations and cultivate strategic partnerships to increase their transportation capacity? How do cities design, build, and maintain adaptable transportation systems to accommodate their evolving community? How do cities address the huge challenge of funding a transportation system that matches the needs of their citizens? Learn what mayors are doing to tackle these issues and move their cities’ transportations systems into the 21st century, and how innovation can pave the way forward. Featuring Gabe Klein, author of Start-Up City. Access: Interactive Badge, Gold Badge, Platinum Badge. More details on the panel here. 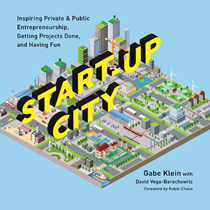 After the panel, Gabe will appear at the SX Bookstore to sign copies of Start-Up City. More details on the signing here. Join Gabe Klein at New York Institute of Technology on Wednesday, March 16 at 2:00 pm. In Start-Up City, Gabe Klein demonstrates how to effect big, directional change in cities—and how to do it fast. Klein’s objective is to inspire what he calls “public entrepreneurship,” a start-up-pace energy within the public sector, brought about by leveraging the immense resources at its disposal. Klein offers guidance for cutting through the morass, and a roadmap for getting real, meaningful projects done quickly and having fun while doing it. Books will be available for purchase on-site with booksigning to follow. Presented by University Transportation Research Center and co-sponsored by New York Institute of Technology. Free to attend, but registration required. Join Gabe Klein at Connected Tulsa 2016 on Thursday, March 31 at 6:00 pm. 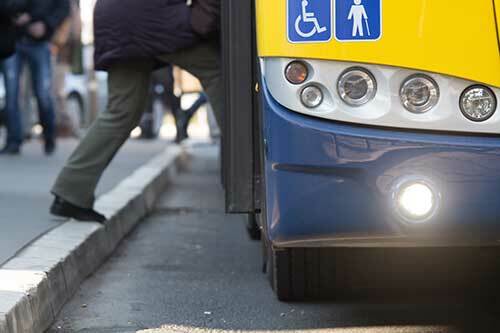 Join the Accessible Transportation Coalition for a thought-provoking evening with Start-Up City author Gabe Klein. Gabe will discuss ways that cities can better address challenges like transportation and urban mobility. A thought-provoking evening including a local panel with Q&A will discuss ways that Tulsa can better address challenges like transportation and urban mobility. Free to attend, but registration required. Be one of the first 50 to register and receive a free copy of Start-Up City upon admission. Food provided. Join Gabe Klein at Pittsburgh Downtown Partnership on Tuesday, March 15 at 4:00 pm. Join the Pittsburgh Downtown Partnership for their 2016 Annual Meeting featuring keynote speaker Gabe Klein, author of Start Up City: Inspiring Private and Public Entrepreneurship, Getting Projects Done, and Having Fun. Gabe is passionate about entrepreneurial public leadership, having implemented transformative transportation initiatives in Chicago and Washington DC. He now works for a venture capital fund focused on utilizing technology in next-generation mobility. Tickets required. Friday, April 15 from 8:30am-4:00pm. The Great Park Summit is an opportunity to showcase the Miami-Dade Parks, Recreation and Open Spaces 50-year plan for connecting Miami-Dade County communities. Using parks, public spaces, natural and cultural areas, greenways, waterways and streets to bring people and parks together, the plan helps to solve some of our city’s most pressing problems. The Summit will highlight innovative planning designs, current trends in the field of planning and will include experts from around the country who will share ideas and best practices in the fields of parks and recreation. Expect a new vision for what Miami can be. Plus, you will hear from compelling speakers, including Start-Up City author Gabe Klein, who will get you think ‘outside-of-the-box’, interactive sessions that focus on the three pillars of Parks: Placemaking, Conservation, and Health and Fitness, and so much more. More details here. Gabe Klein is the author of Start-Up City: Inspiring Private and Public Entrepreneurship, Getting Projects Done, and Having Fun. Gabe Klein will be the keynote speaker at DesignDC this August! DesignDC is the premier regional conference focused on the unique challenges posed by working in Metropolitan Washington for architects, interior designers, engineers, contractors, planners, landscape architects, and developers in the DC Metropolitan area. This three-day conference features two days of educational sessions and trade show exhibits at the Washington Convention Center, and a third day full of opportunities to tour projects across DC, MD, and VA. Purchase Start-Up City: Inspiring Private and Public Entrepreneurship, Getting Projects Done, and Having Fun at a special price, $15, as you complete your conference registration and you could get your copy signed by Gabe during DesignDC! More details here. Gabe Klein is the author of Start-Up City: Inspiring Private and Public Entrepreneurship, Getting Projects Done, and Having Fun. Gabe Klein will be the keynote speaker at the Central Ohio Transit Authority (COTA)'s annual luncheon this August! Each year at the luncheon, COTA celebrates partnerships, collaboration and shared visions for the community. The luncheon emphasizes the importance of a united vision for the future of Ohio's public transit. 90.9 WBUR/Boston "Here and Now"
NPR/Diane Rehm Show. Read the blog here. More than ever, cities are charged with carrying out national-level policies and are expected to be at the forefront of our response to climate change, housing inequality, job-creation and public health. At the same time, most city government agencies are perennially understaffed and impeded by cumbersome, often backward regulations that leave them at odds with the private sector. Seemingly insurmountable frustrations are everywhere. So the big question is: Can meaningful changes get made in spite of these realities? Change agent Gabe Klein argues yes and proves it with his new book Start-Up City: Inspiring Private & Public Entrepreneurship, Getting Projects Done, and Having Fun. Check out an excerpt below and see why former US Secretary of Transportation Ray LaHood called it "a must-read for anyone interested in making positive change in our cities." Interview with Gabe Klein: Have We Reached 'Peak Car' In Cities? Options like Uber, Lyft, Zipcar, and bikesharing have some people stepping out of their cars and turning to alternative modes of transportation. Do these new options mean we've reached peak car use in cities? Transportation guru and Start-Up City author Gabe Klein weighs in on National Public Radio's "Here and Now." Hear what the former DOT director of Washington, DC and Chicago and former Zipcar executive has to say about which cities are leading in transportation innovation, what a decline in car use means for equality, and more. Where there's a will, there's a way. That's what Gabe Klein believes anyway. The Start-Up City author made a name for himself in government and in start-ups as a change agent who can cut through the morass to get things done. His new book outlines seven lessons he's learned for inspiring private and public entrepreneurship, getting projects done, and having fun. His ideas are generationg a lot of attention: NPR, LA Times, USA Today, Washingtonian, and more have all recently spoken to him about his expertise. Check out Lesson #3‒Where There's a Will, There's a Way‒from his book below and see what all the buzz has been about. Ask Island Press: How Could Buses Be Better? Buses are having somewhat of a moment. This spring, the Washington Post asked if riding the bus is finally becoming cool, while Lyft is beta-testing a shuttle service that many have compared to the bus, albeit one that may perpetuate problems of inequity. At Island Press, we're fans of public transportation, or anything that gets people out of their cars and reduces the need for parking. But buses are not above critique. To find out how buses can be better, we asked bus-commuting Island Press staff and authors: What would you change about the bus system? Check out their responses, and share your ideas for improving buses in the comments below. "A reliable schedule app—one that really woks and shows when the bus is coming, weather-protective bus stop furniture that helps riders feel safe, too, and direct routing whenever possible." "More attentive to folks waiting around the bus area. Sometimes while waiting for a bus I go under the shade of a tree or sign and the bus driver drives past because he doesn’t look anywhere but the bus stop itself, dedicated bus lane, and more routes while Safetrack is happening." "On major arterial streets I would love to see dedicated bus lanes that would make the bus more reliable, faster, and easier to figure out where it goes; like rail with physical tracks. Also, smaller busses in neighborhoods that are size appropriate and more flexible in pickup and drop off. Last, a simpler naming system so it was more clear where the bus went, and a digital interface with simple payment, trip planning and transfer." "I would like accurate tracking of incoming buses (the current app estimations are not always correct), and perhaps a visual of the buses along the route to help understand how far away they are." "Bus service needs to be legible and frequent, and forming a connected network (including with Metro). Then, to the extent feasible, it needs to be protected from traffic. European buses are also generally better than US in terms look-and-feel and amenity. These things can all be gotten right, to deliver a 'rail-like' experience without the expense and operational hassles of rail tracks in the street." "Better bus tracking, no more ghost busses. Watching a bus vanish from the list of upcoming arrivals, with no new busses coming for a half hour or more, is the single most frustrating thing about bus travel for me."